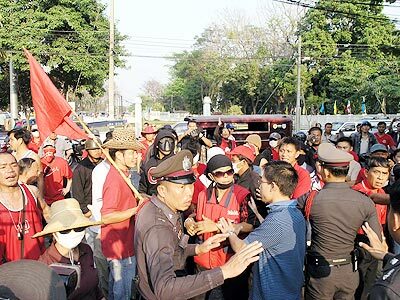 Red shirted demonstrators from the Rak Chiang Mai 51 group tangle with police as they try to halt the Gay Pride march in Chiang Mai, Saturday, February 21. Five hundred Lampang-based plaintiffs in a pollution lawsuit brought against the Electricity Generating Authority of Thailand (EGAT), crowded into Chiang Mai’s Administrative Court on February 25 to hear judgement passed in favour of their claim. The presiding judge, Jeerapat Klomsakul, stated that the respiratory diseases of all plaintiffs in 19 separately filed cases were caused by dispersal operations and leaks of pollutants at EGAT’s lignite mine. According to the judgement, since 1954 EGAT had operated the mine in a manner that neglected the law, the effects of the mine’s operation on the environment, and the effects of the pollution caused on people in the surrounding communities. Jeerapat noted that quantities of sulphur dioxide at concentrations as high as double the legal limit were released 279 times during a period of 5 years and 7 months. Local residents affected have not yet completely recovered, and will require regular medical attention. The immediate area has accumulated a significant amount of pollution, which is not yet cleared, and may cause further damage to residents’ health. Maybach release the Zeppelin - another Hindenburg? 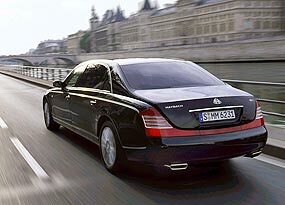 Daimler-Benz is releasing a newer and even more plush version of the Maybach at the Geneva show. A collaboration between MaeJo University, Central Luzon State University (CLSU) in the Philippines and the event’s major sponsor, the San Miguel Corporation, resulted, on February 21, in an unusual and perfectly delightful evening of Filipino music and dance.